Spireas are among the easiest flowering shrubs to grow. 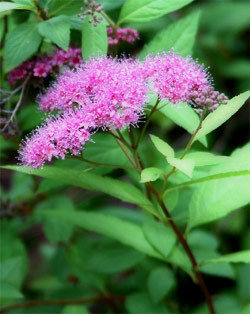 Spirea have over 80 species, some of which have dozens of varieties. They are a member of the rose family and are tough plants. 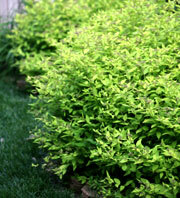 All spirea have small leaves and fine, twiggy branches. 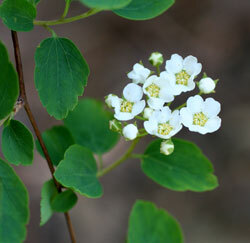 There are two distinct kinds of spireas: the bridal wreath type, with clusters of white flowers on arching branches in spring; and the smaller, shrubby, much lower-growing type, which has pink, red or white flowers clustered at the end of upright branches from late spring through to fall. Spireas are easy to transplant with spring and/or fall being the best planting times. These shrub prefers partial to full sun. Full sun and in open areas provide the best flowering. Spireas are tolerant of many soils except extremely wet. The plant also likes mulch and summer watering. After flowering has finished, prune the mostly spring-blooming, bridal wreath spireas. On the larger bridal wreath spriea types, thin out old, woody and weak individual canes to the ground annually. Periodical severe pruning may be necessary otherwise. With severe pruning, you will lose the bloom for that season. Prune the smaller, summer-blooming, shrubby spireas in winter or early spring. They generally need less severe pruning than bridal wreath spireas. After flowers fade, a light pruning will produce a second flush of growth and additional flowers. Japanese and bumald spireas should be pruned in early spring to promote the best flowering. Remove dead, diseased, and broken branches anytime. Spireas can be severely pruned and will grow and flower again. Spireas are not heavy feeders. Fertilize once a year in the fall, or early spring. Use an all-purpose slow-acting granular fertilizer on the soil around the base. This will provide consistent, steady nutrition for several months over the growing season. As already mentioned, spireas are pretty tolerant shrubs. A thin layer of mulch will help keep down weeds, moderate soil temperature and retain moisture during hot spells. Aspirin is the generic medical name for the chemical acetylsalicylic acid, a derivative of salicylic acid. Compounds of salicylic acid are found in some plants, notably white willow and meadowsweet (Spirea ulmaria). Acetyl- and spirea which inspired the name aspirin.